Three watershed events in trail planning occurred by the end of 2012. The Tampa Riverwalk received a federal grant to complete construction of this 40-year-old vision. The Tampa Bypass Canal Trail, creating a “spine” through Hillsborough County, and connecting other trails, was found to be feasible. And the construction of the Upper Tampa Bay Trail was funded from Van Dyke Road to Lutz Lake Fern Road. These events led to the question “What next?” To answer that question, on May 21, 2013, the Tampa and Hillsborough Greenways and Trails Committee and the MPO’s Bicycle Pedestrian Advisory Committee hosted a Trail Summit at All People’s Life Center. Summit participants agreed that the first step was to inventory existing and proposed trails in Hillsborough County. Mapping of existing trails was conducted with the assistance of Geographic Information Systems (GIS) databases maintained by the County and MPO. 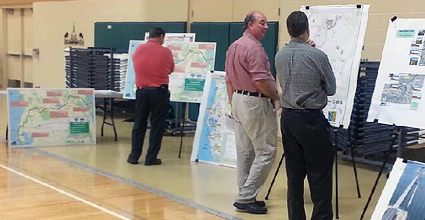 Staffs from each municipality in Hillsborough County, and the Florida Department of Transportation and the Department of Health, assisted in collecting data on existing and proposed trails. Inter-jurisdictional discussions confirmed that the numerous projects built in the last decade can be linked together to create a comprehensive, connected, countywide Hillsborough trail network. On exhibit were Hillsborough County’s top 10 Safety Projects, the City of Tampa’s current sidewalk and bicycle lane projects, a new Vision Trail map, the Green Artery, the Tampa Riverwalk, the Coast to Coast Trail Connector. Also on the agenda was discussion and adoption of Trail prioritization criteria. For further information please contact Michele Ogilvie at (813) 273-3774 ext. 317.